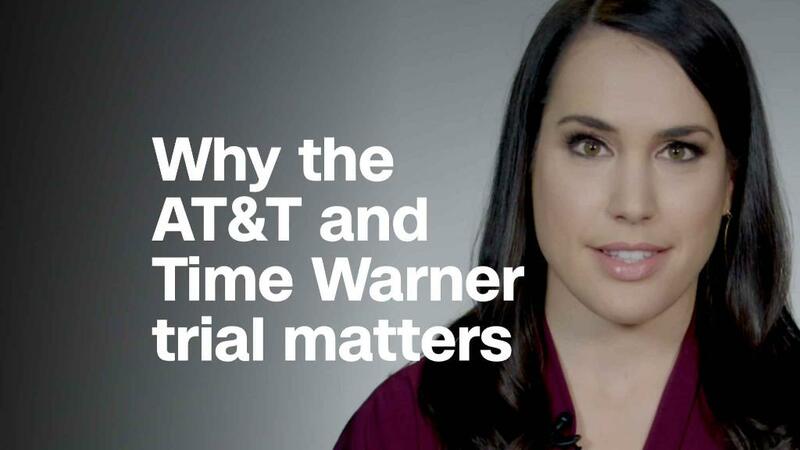 AT&T and Time Warner's lead attorney is making the case that Time Warner content may not be as vital to distributors as the government is making it seem in the Justice Department's lawsuit to stop the two companies from merging. It might seem unusual for an attorney to argue that his client's product is not all that valuable, but it's an attempt to shake the government's assertion that Time Warner content is considered "must have" by distributors and therefore shouldn't be placed in AT&T's hands. In court on Tuesday, AT&T and Time Warner's lead attorney Dan Petrocelli questioned one of the Justice Department's key witnesses Warren Schlichting, the president of streaming service Sling TV, which is a part of satellite television company Dish. During direct questioning from Justice Department lawyers on Monday, Schlichting said a Time Warner and AT&T combination would harm his company by raising prices, or by taking away customers who would leave if Dish could not reach a deal to air content from Turner networks like CNN, TNT and TBS, which Schlichting says carries "must have" content like live sports and news. Those lost customers could easily walk over to Dish's main competitor, the AT&T-owned DirecTV and its new streaming service DirecTV Now, Schlichting said. "There would be severe bleeding," he said about the merger if it went through. But Petrocelli on Tuesday tried to poke holes in the argument with a list of sporting events not actually carried by Turner. Those include all NFL, NHL and NASCAR events, the Olympics and the Super Bowl. Petrocelli pointed out that the Super Bowl, while available to Dish subscribers, will in fact not be available next year to Sling subscribers because it does not carry CBS. Petrocelli repeatedly quoted Dish co-founder and chairman Charlie Ergen, who in 2014 said Turner content, specifically CNN, is "not a top ten network" any longer and is "not quite the product it used to be." Schlichting pushed back and said that "CNN has gained popularity since then." The government has sued to stop AT&T's $85 bilion takeover of Time Warner, CNN's parent company, arguing that it violates antitrust law because it will raise prices for consumers, harm competition and stifle innovation. AT&T has argued that prices would not necessarily go up, and would in some cases go down. Attorneys for AT&T and Time Warner have said that the acquisition is necessary for AT&T to compete with the likes of Facebook, Apple, Amazon, Netflix and Google, as they increasingly enter the content markets. The trial is expected to last nearly eight weeks. Petrocelli also claimed that Dish often cuts off networks from its platform -- called a "blackout" -- when a deal can't be reached, and that Ergen has specifically used those blackouts as a negotiating tactic. Petrocelli said Ergen called it a "non-event" when Turner networks were dropped from Dish in 2014 for about a month, saying if they permanently lost networks like Turner "we'd lose customers but we'd save big, big, big check from a cash flow perspective." Schlichting countered, saying the merger between AT&T and Time Warner would change the calculations. Schlichting almost did not take the stand. On Monday, government lawyers informed Judge Richard Leon that Schlichting's counsel sent him a transcript of the opening statements and of the Justice Department's first witness. Witnesses are not privy to such information, so as to avoid being influenced. Leon allowed Schlichting to testify, though he issued a stern warning to both sides. Leon questioned Schlichting specifically about Sling TV's "skinny bundle" and whether he uses performance data in negotiations with networks to show that certain channels aren't as popular and therefore should be cut. Schlichting said they have the data, but that "it's rare we can unplug any network." Turner CEO John Martin took the stand late Tuesday as an adverse witness for the Justice Department. In initial questioning, the government sought to establish that Turner has some of the nation's top entertainment networks including TBS and TNT and the importance of CNN to the company's revenue. Martin's testimony will continue through Wednesday. The government also indicated that it intends to call Cox Communications marketing executive Marty Hinson to the stand on Wednesday.